Molina said she saw the truck drive “full speed” over the crowd. “I cant even tell you how many people I saw die in front of my eyes,” Molina recounted. Molina says the truck moved east and, at one point, she couldn’t see it anymore — that’s when she heard gun shots. “As soon as he went out of our view, I started hearing gunfire. A lot of gunfire. It was like a shooting range,” she said. The shooting lasted for a minute or so, she recalled, before there was total silence. “Horrific screams of agony” filled the air, she remembered, as people realized how many bodies there were lying on the ground. “You have to understand the crime scene itself is two miles long, there’s just a pathway of bodies,” she said. 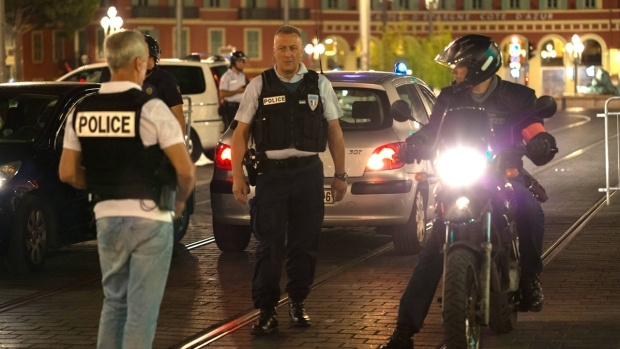 The driver was killed by police, Hollande said in an address early Friday morning. It wasn’t immediately clear if he had any accomplices on the attack, which Hollande called a “monstrosity,” but authorities are looking into his identity. In Nice, a city in the French Riviera near Monaco, other witnesses to Thursday’s attack described seeing people mown down and the driver of the truck pull out a gun and fire at the crowd, NBC News reported. “From my terrace, you can just see bodies, everywhere, and they’re still there right now, I can still see them. It was just very, very horrific,” she said. “I feel relieved to be safe but at the same time in a weird way I feel a little guilty, that I was safe from it. I cant explain why, it’s a strange feeling,” she said. She left San Diego the day after the Fourth of July, she said. The family is supposed to stay in Nice for the next week, she said, but she said their plans going forward aren’t as clear as they once were.